Clearly, good information management is crucial for organizations to work smoothly. And to improve information management, managers must know their customers, know their employees and know the market. SoftExpert Survey software provides everything needed to easily design, deploy, process and report on questionnaires, quizzes, polls, tests, self-assessments and evaluations across the enterprise, to speeding up decisions and assisting employees, suppliers, stakeholders and customers. Customer satisfaction, employee engagement, market research, academic insights, control and risk self-assessment, process validation and supplier scoring – all of these business needs are found in just one solution, reducing costly errors, streamlining operations and increasing overall responsiveness. 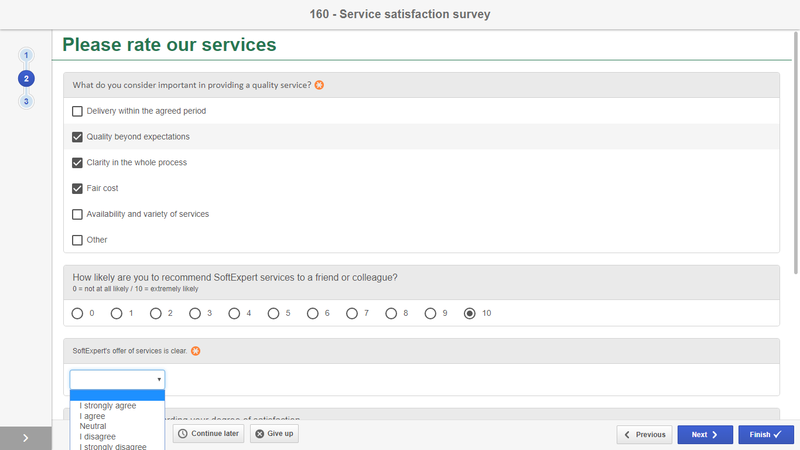 With an intuitive interface, SoftExpert Survey allows users to create and publish a survey in minutes. 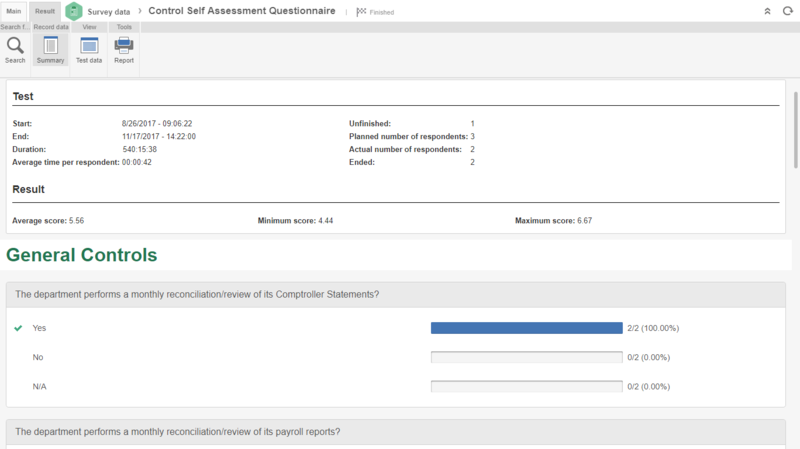 Questions, scores and pages can be added and the survey can be edited according to user preferences. To get proper feedback, surveys need to find their way to the right audience. With SoftExpert Survey strongly aligned with the whole SoftExpert’s Suite of solutions, users can reach out to an organization’s audience and get much more than simple siloed questionnaires. With the SoftExpert Survey analytics tool, get better insights and make better decisions. View responses on aggregate and create filters and cross-tabs to obtain an in-depth analysis. 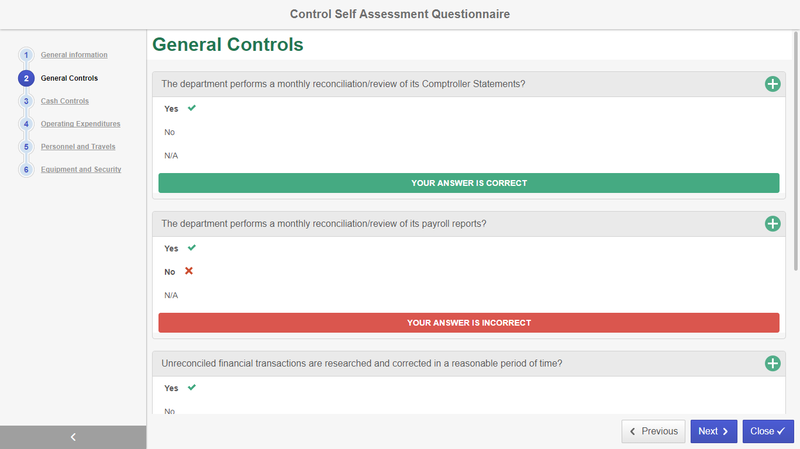 Multiple question styles, including grids, single response, multiple response and free-text. Use images in place of text for question and answer labels. Import respondent lists using spreadsheets. Schedule automated survey e-mail invitations. Manage survey schedules online – invites and panels. 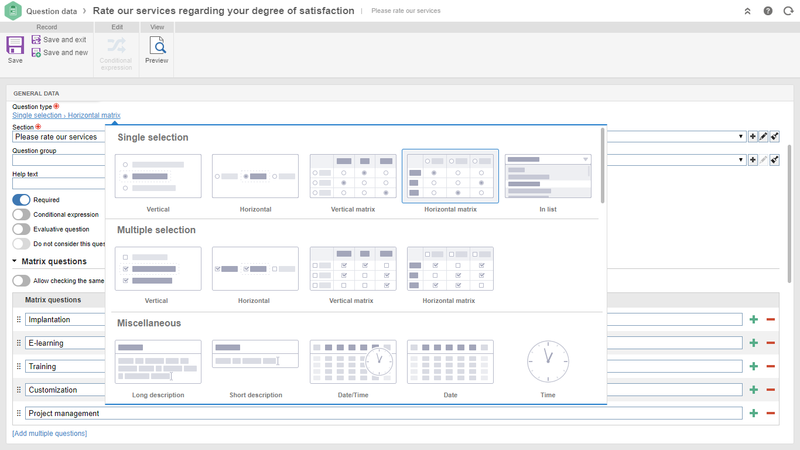 Automate interview start and finish dates. Provide critical analysis of results. Option of display questions randomly. Produce dynamic and flexible reports. View an instant summary of survey results. Simplify data with analytic tools. Share analysis and reports online. Export data into PDF, RTF and other formats. Read this eBook to learn more about 5 strategic processes for ECM (Enterprise Content Management) success.